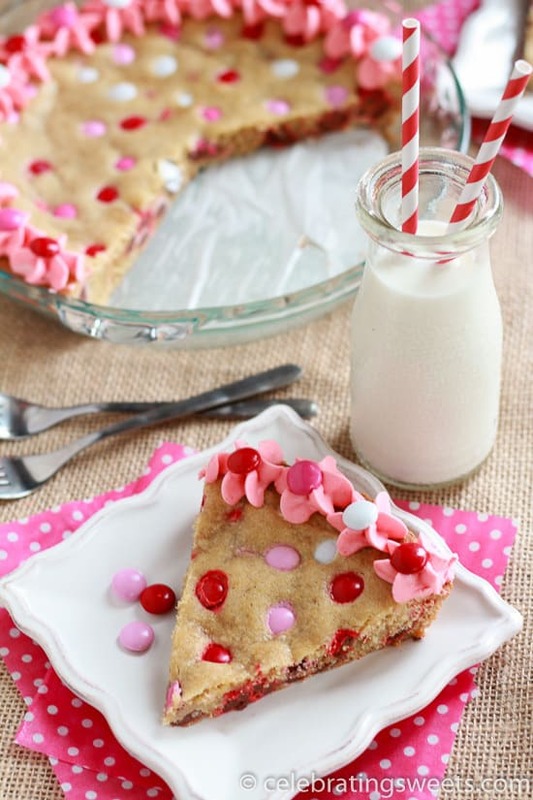 M&M Cookie Cake – A giant M&M cookie baked in a pie dish and topped with vanilla frosting. Soft and chewy and loaded with M&M’s. The last couple weeks I have been testing recipes. And testing means tasting, and then tasting some more, and a little more after that – which means I have eaten dessert like 5 times a day for several days in a row. Is it a Pie? Is it a Cake? It’s a giant Cookie! Last year I made my first cookie pie, which is essentially a giant cookie that is baked in a pie plate, garnished with frosting and served in slices. 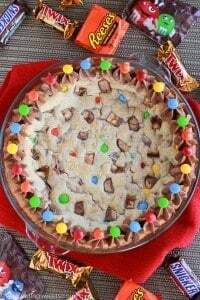 My last cookie pie was filled with chopped candy bars. 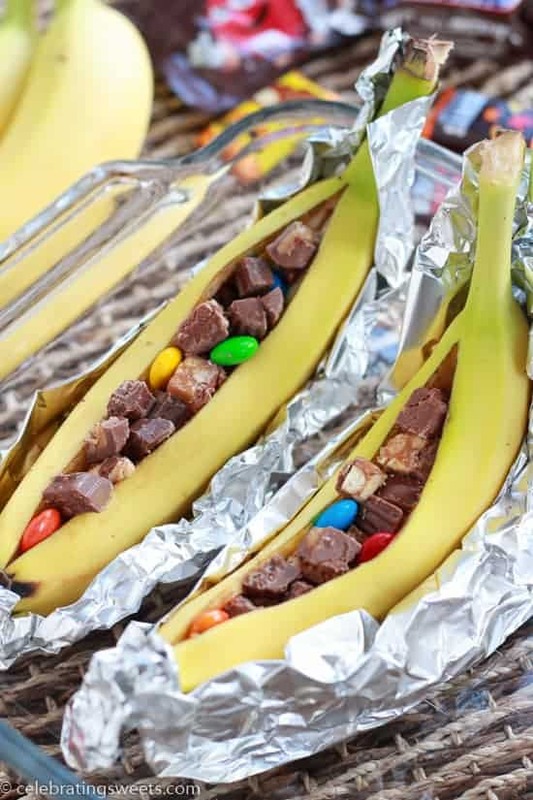 It was Halloween and I had candy bars lying around, so I figured, why not? Best. Use. Of. Candy. Ever. I loved that candy bar pie. 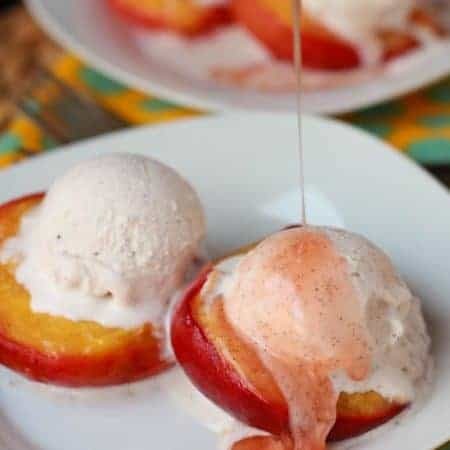 It was one of my personal favorite recipes of last year. I figured I would take the same idea, and this time use only M&M’s. I used Valentine’s M&M’s, since the holiday is near. 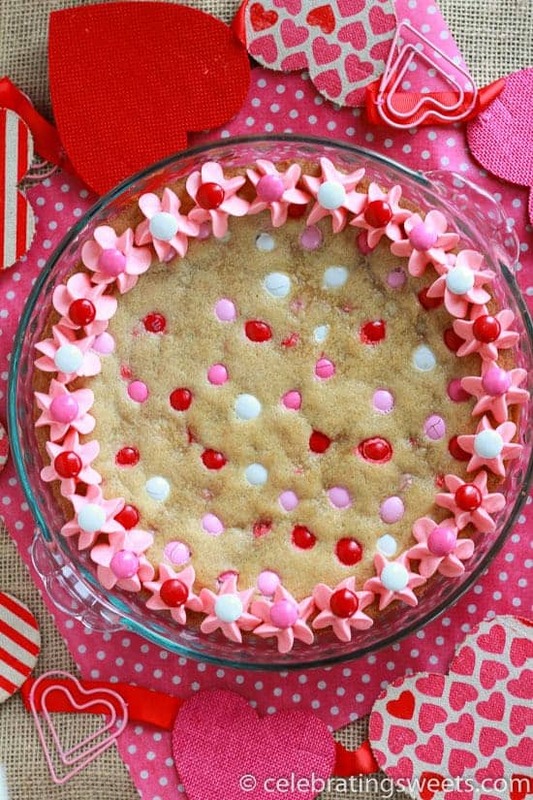 I was thrilled with the way this cookie pie came out. It’s soft and slightly chewy, loaded with M&M’s, and made extra pretty (and tasty!) by the addition of pink buttercream frosting. You can make this cookie pie anytime of year, with any variety of M&M’s. You could even purchase specific colored M&M’s to match the theme of a party (I’m already thinking all pink for my daughter’s first birthday!). 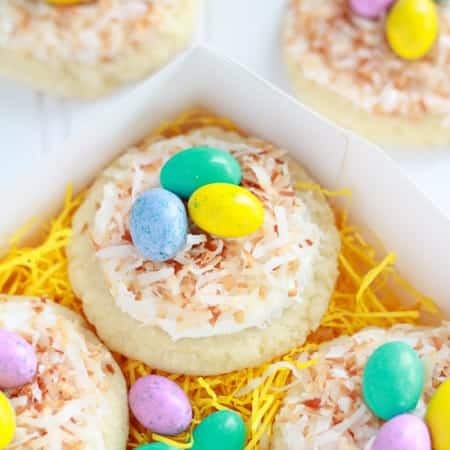 Kids and adults will both love this recipe – it’s a crowd pleaser! 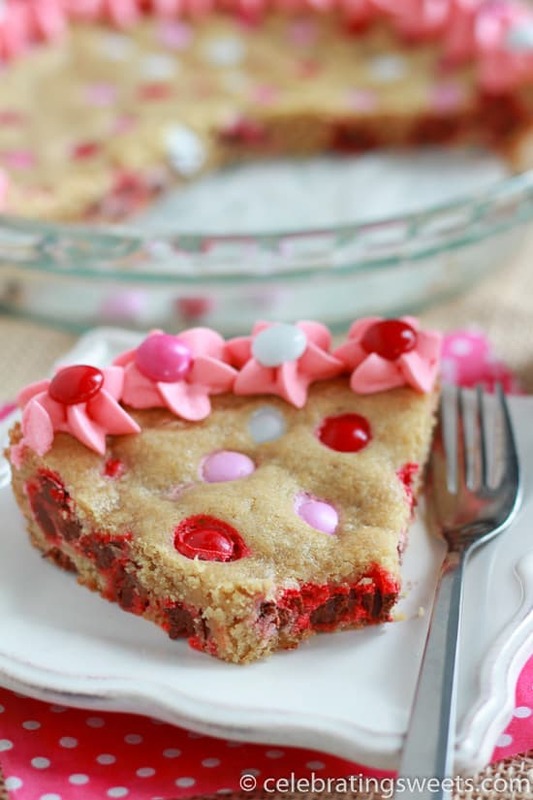 A giant M&M cookie baked in a pie dish and topped with vanilla frosting. 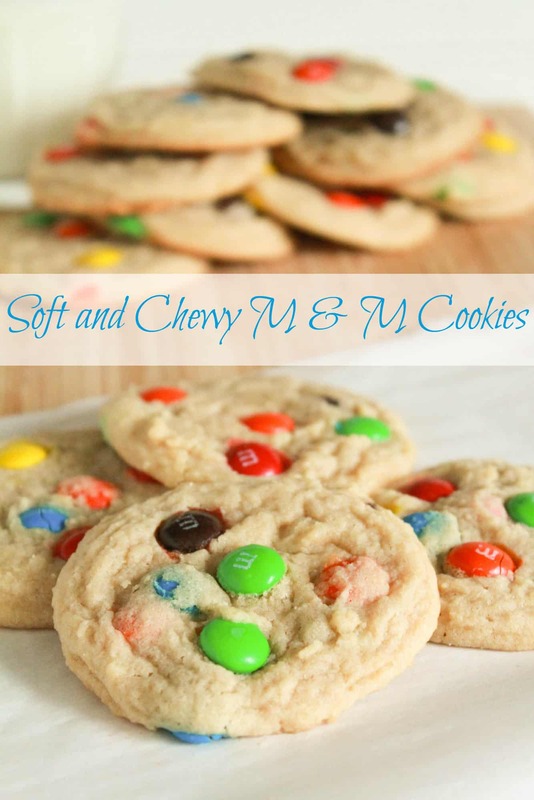 Soft and chewy and loaded with M&M's. Preheat oven to 350°F. Line a 9 1/2 inch pie dish with a round of parchment paper and grease the dish. Set aside. With a hand mixer or stand mixer, beat butter and sugars on medium speed for about one minute, until smooth and creamy. Add egg and vanilla extract, and beat to combine, scraping the sides of the bowl as necessary. In a separate bowl, combine flour, cornstarch, baking soda, and salt. With the mixer on low, slowly add the flour mixture to the wet ingredients, beating until combined. By hand, stir in 3/4 cup of M&M's. Evenly press the dough into the prepared pie dish. The dough will be thick and sticky.Wet your fingertips with a little water (if necessary) to help flatten the dough into the dish. 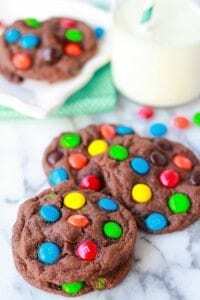 Lightly press the remaining 1/4 cup M&M's over the top. Bake for 23-25 minutes, until light golden brown. Cool completely. 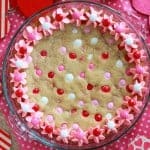 Use a decorating tip (I used a star tip) to frost the outer edge of the cookie. Decorate with additional M&M's, if desired. 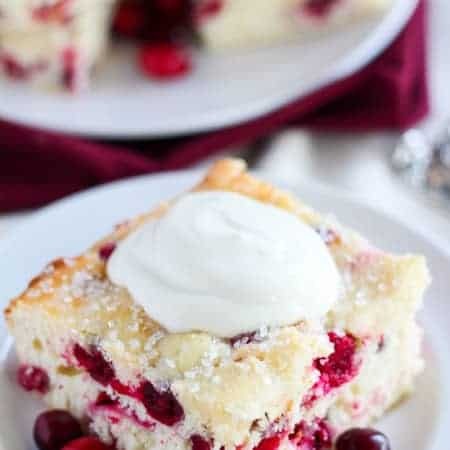 This looks great and am looking forward to making it! Question for you though – I want to make this bigger (for more people) so was thinking a 9×12 pan can work for this too? Although how do you suggest up’ing the ingredients? Thanks in advance! Hi Lindsay! I referred to the link below and I believe that a 9×13 (not sure about 9×12) holds about double the volume of a 9.5in pie dish. I would guess that you could double the ingredients, but I’m not 100% sure since I’ve never tried it in that pan size. Another alternative would be to make two “pies” if you need to feed more. Good luck! Awesome, thank you so much! And yes, you’re right (my typo on the 9×12, in which I meant 9×13). Appreciate your advice!